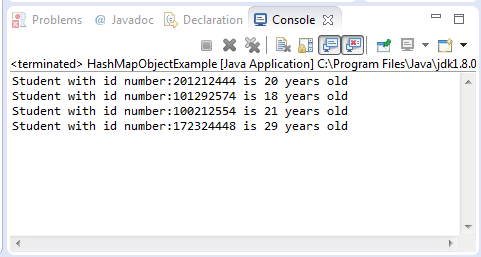 One of my favorite of all the Collections classes of Java is the HashMap. Its easy to use and easy to understand. HashMap is actually a hash table implementation of the Map interface. The HashMap class is equivalent of HashTable only that the HashMap allows null values and keys. Moreover hashmap is unsynchronized compared to HashTable. Since this is a lot faster because it is not synchronized however it would not be thread safe. In dealing with this class, always remember that the order of elements is changing over time. In other words the placement of element on this pool of objects is dispersed. Now that we have described the HashMap let’s take a look on a simple example. Its also been shown how to add elements on the hashmap using the put method. The get() method were used to access the corresponding value of the specified key argument. This example deals with the use of hashmap in storing of objects. There are a lot of things that happen to this example but to give you an overview here’s what it have. Create a Student class which takes a string on its constructor. The constructor must able to parse the string into tokens and assign it using the setters and getters of the Student class. The init method should be able to return a HashMap with id as the key in getting Student values. Print all the id number on the hashmap and then the student age with respect to the id number. System.out.println("Student with id number:" + s + " is "
Basically we just instantiate a hashmap that takes a String object as its keys and a Student as its values. This is basic of Generics. We have used Generics to avoid mistake in passing arguments to our HashMap. To make it short this HashMap wont accept Integer or any other Object type as its keys. Moreover the value will not accept any other object other than Student object or its subclass. The use of the constructor to initialize the values of the student class. This is very simple idea, pass a string to the constructor and then use StringTokenizer to broken down the string argument into tokes. Use of the setters and getters to set and access the attributes of Student. We have also used one helpful method of the HashMap class which is the keySet(). This method returns a Set which corresponds to the keys on our HashMap. We then use these keys to get the values on our HashMap and eventually we now have access to all the attributes of Student object. The following are the detailed list of HasMap methods and descriptions. We have also provided links to examples of each method on the list. Basically this method is to delete all key value pair mapping on the HashMap. After invoking this method, the HashMap will be empty thus calling the isEmpty() method will return true. is used to check if the key that we have is available on the list of keys on our HashMap object. Generally we need to pass an object as method argument to the containsKey() method. this method is to check if the HashMap contains the Object value specified as method argument. This method returns true if one or more keys were found that contains the specified value, otherwise return false. This would be helpful on scenario wherein we have to check the existence of a specific name already only the map so as to avoid duplication. return a set which is a view of the HashMap object. Because this method is backed with Map class, any change on our HashMap will get instantly reflected on the Set and vice versa. returns the value which corresponds to the key specified as method argument. return a default value whenever the value was not found using the key specified on the HashMap. returns true if the HashMap object contains zero key-value combinations. This method might be useful in situation wherein we have to test if the map is empty or not and do business logic depending on the result. get all the keys that the HashMap contains. This method can strategically be used to iterate to all the contents of the HashMap which means this is a good way to get the values. add key value pair to the HashMap object. Please take note of the Generics before using the put method. Basically this method is being used to insert a new a new key-value mapping to the hashmap object if the respective id is not yet used. A value null will be returned if the key-value mapping is successfully added to the hashmap object while if the id is already present on the hashmap the value which is already existing will returned instead. remove/delete key value pair to the HashMap object with the key as the method input. As other methods of HashMap class, Generics should also be considered in using the remove() method. accepts a key and a value mapping which will replace the existing value of the key-value mapping by the value method argyment if the key is found on the HashMap otherwise the method will not do anything. this method will only replace the existing key-value mapping if the key and oldValue is found on the HashMap.